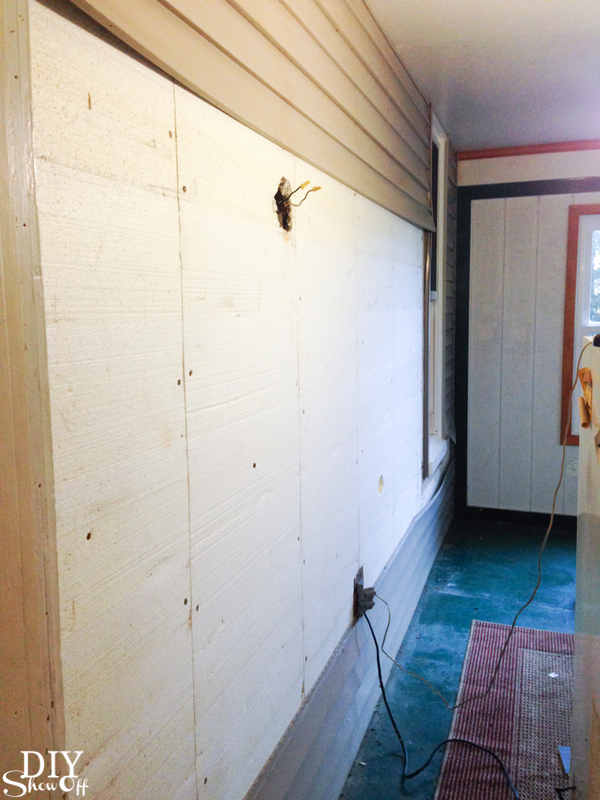 More progress on the enclosed porch turned room makeover! When I visited Shaw Floors headquarters last summer, I had the opportunity to see all of their amazing high quality flooring products from awesome waterproof carpet to beautiful hardwoods to unbelievable waterproof planks. So much thought and innovation goes into the design behind the scenes! The many features of a product called Floorté caught my eye. 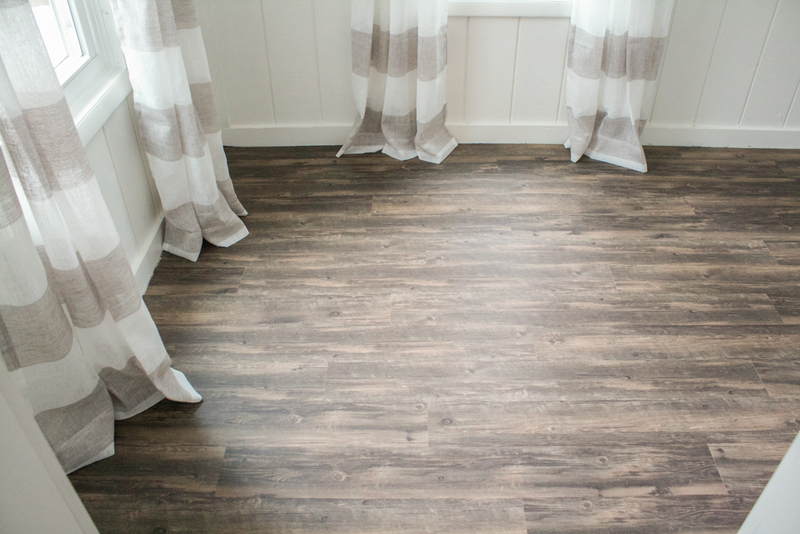 Floorté, enhanced luxury vinyl plank floor by Shaw is a luxury line locking durable, waterproof flooring option and I am in LOVE! 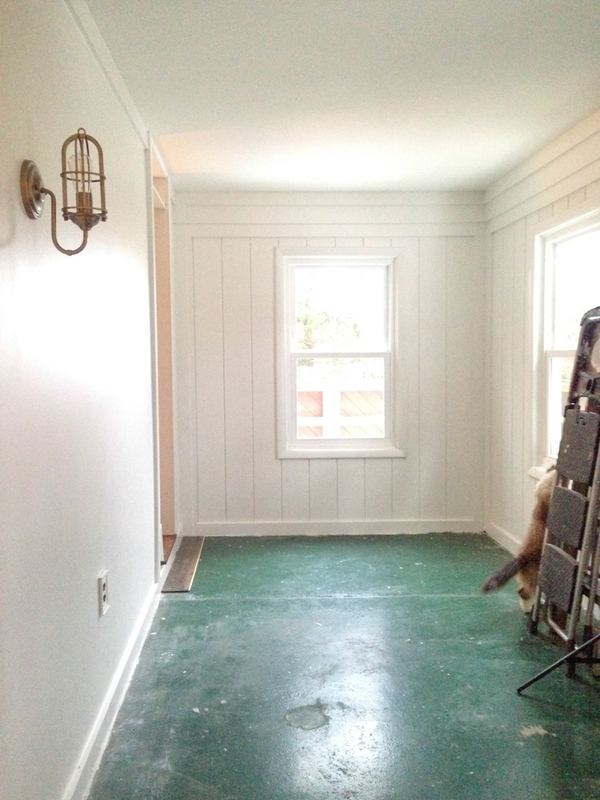 to the after drywall/trim/paint and light fixture…it’s beginning to look like a different room altogether, right? That’s the plan! to the installation of the Floorté. I chose the design “Antico” from the Classico collection. 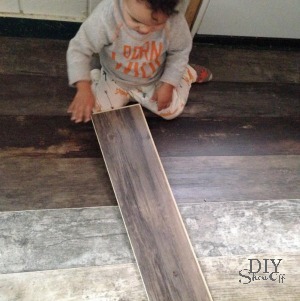 It’s a beautiful distressed-inspired look with gray/brown wood tones. I think it resembles weathered wood. 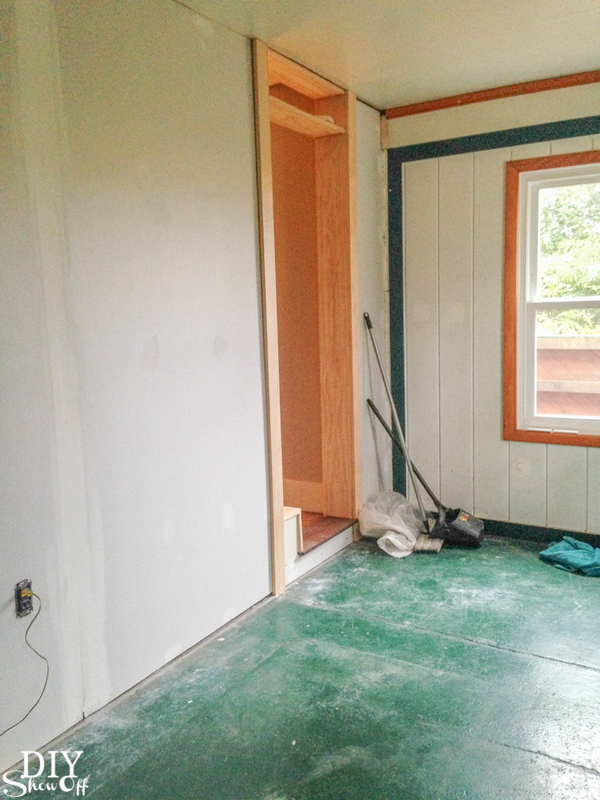 Our installer, Mike, subcontractor from A&S, knocked out this installation in half a day! 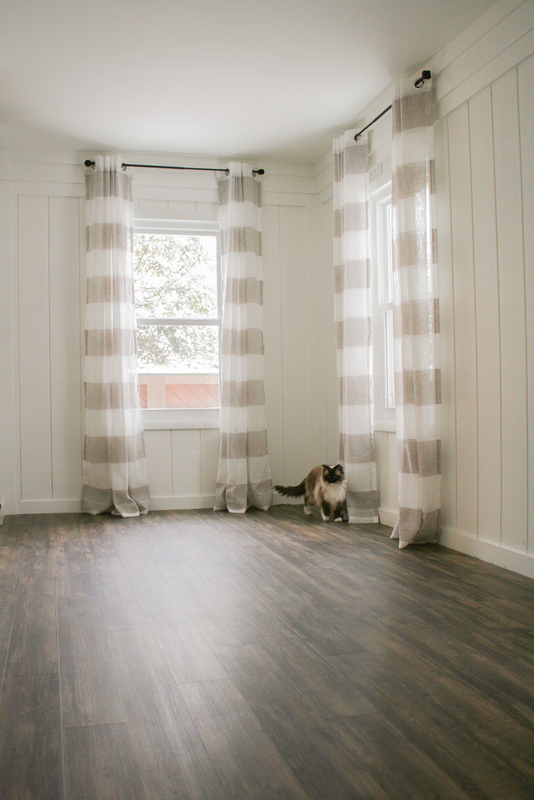 Next step is for us to install shoe molding and to complete decorating but I couldn’t resist putting up the curtains. 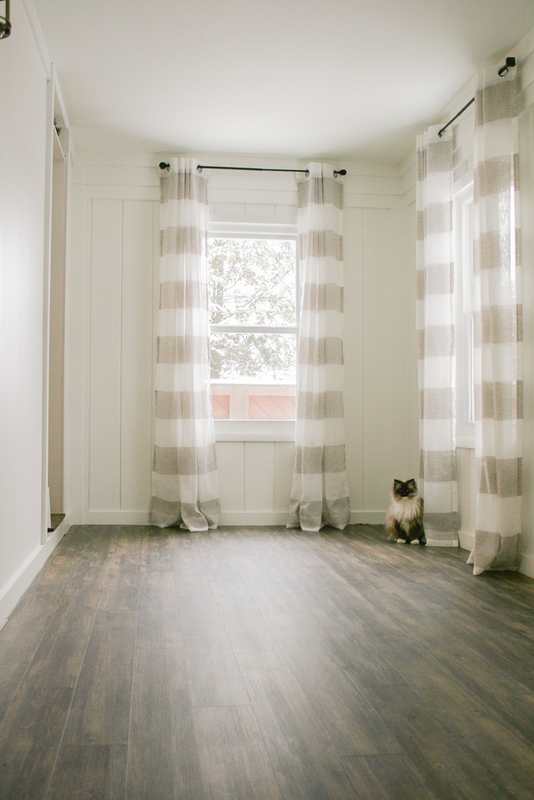 I just need to make a few decisions on this room’s purpose then tweak the fine details so more on the final reveal coming soon, but in the meantime – isn’t she lovely?! 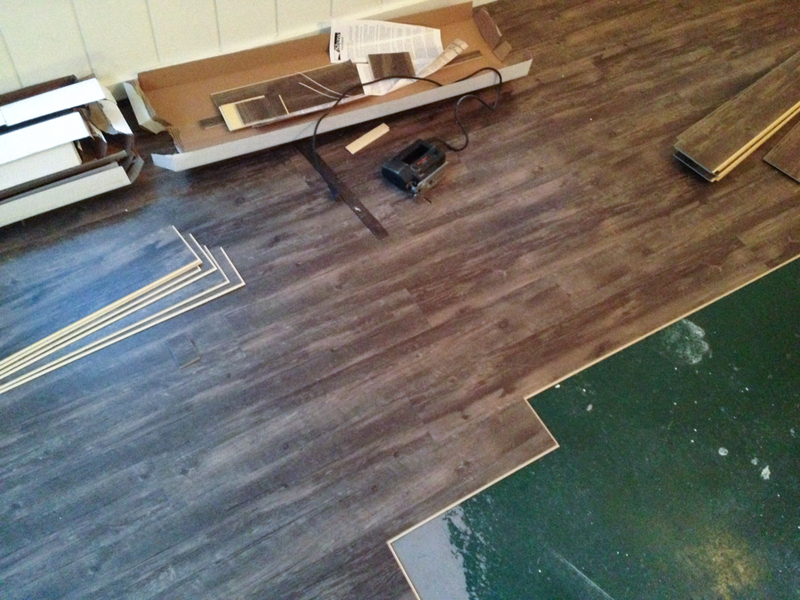 Stay tuned for the final before and after room reveal with this gorgeous Floorté flooring! 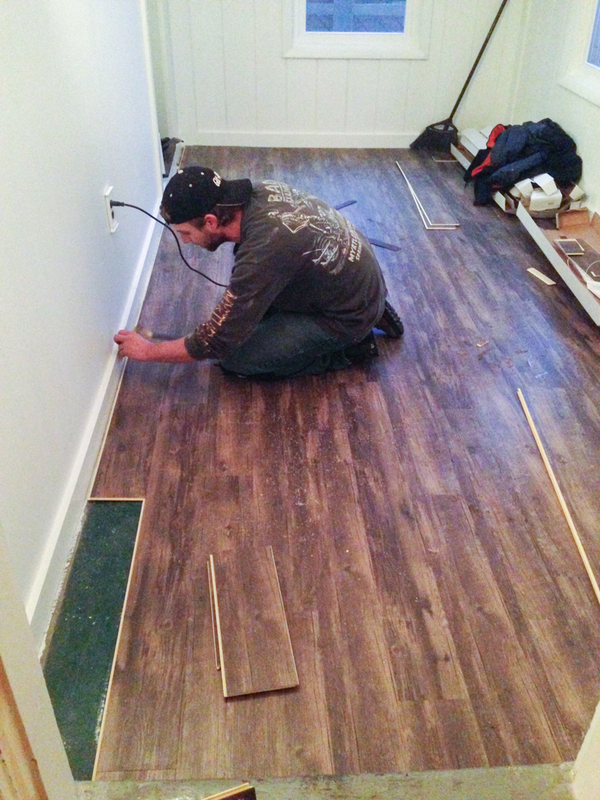 This entry was posted in Floors and Rugs, Home Improvement, Home Offices, Reading, renovation, Shaw Floors, sitting room and tagged ad, flooring, roommakeover, shawstyleboard by Roeshel. Bookmark the permalink. Gorgeous! Love your curtains too! 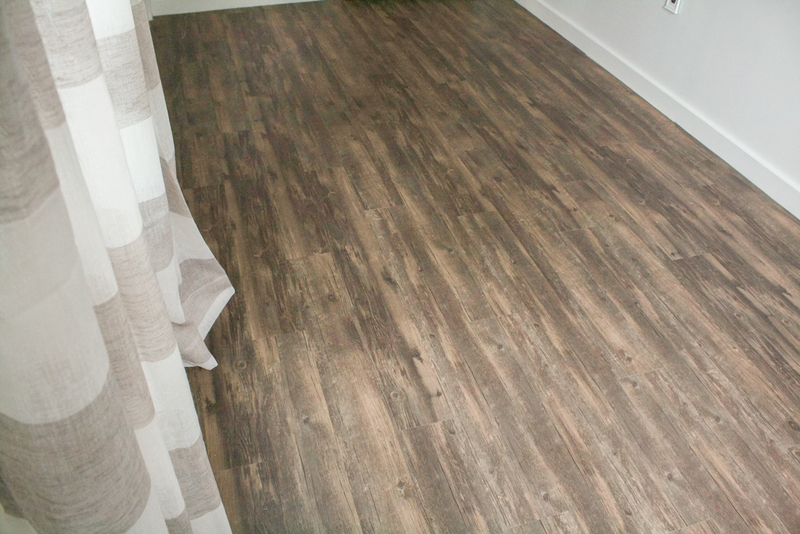 We installed a peel and stick vinyl plank flooring in our kitchen last year. I love the look however I think the one we purchased was a bad batch or too cheap because it is all scratched. 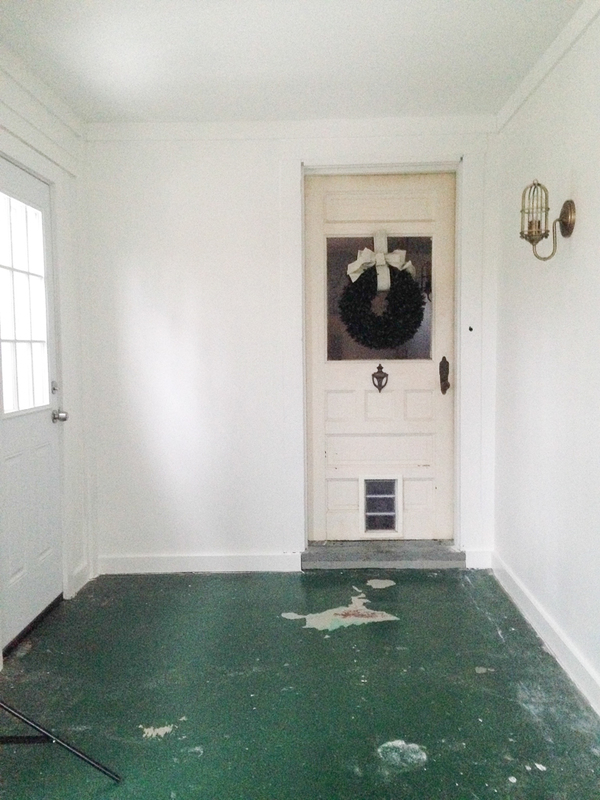 We have to replace it along with damaged laminate flooring in our living room and dining room. I want to do vinyl again but a better brand. I have seen this type of flooring and am considering it. The only issue is that e have to cut around a 4 by 4 foot fish tank that cannot be moved. It may be tricky. Looking nice and neat! Love it! Did you have to silicone/caulk the edges? 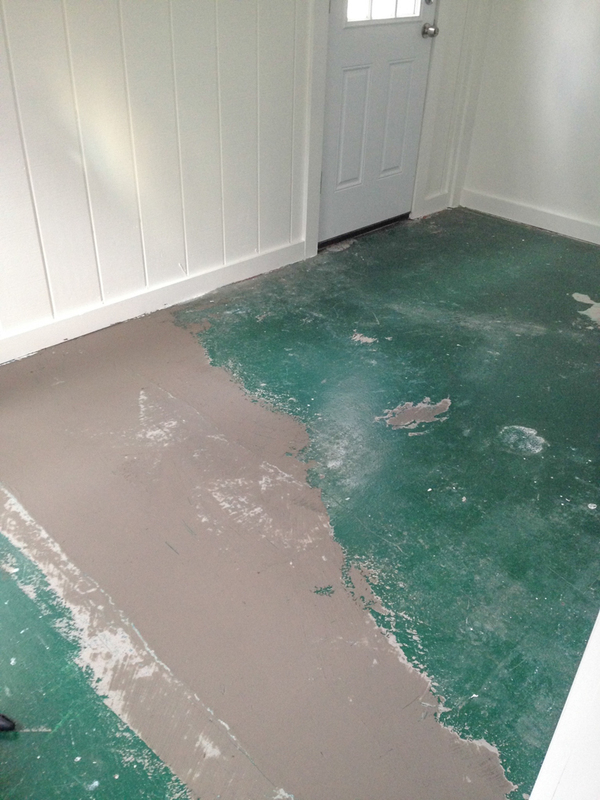 I’m not sure what you mean but no, we didn’t caulk/silicone the edges. 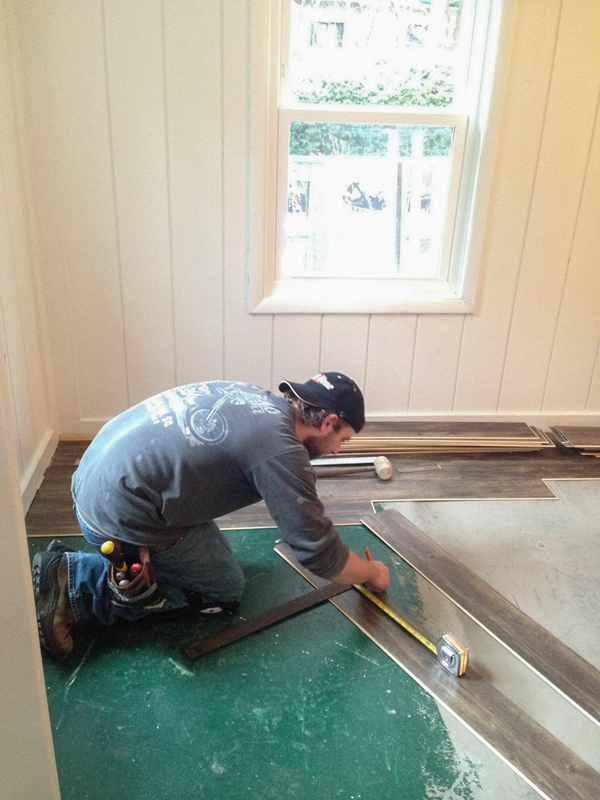 We didn’t remove our baseboard trim, so we will be finishing the space with shoe molding (quarter round) where the floor meets the baseboards. How is this flooring holding up? I have a pallet full of it in the garage waiting to be installed. I’ve been reading a lot of bad reviews and now I’m scared. Also what kind of area rugs do you use. I read in the directions no rubber backed. Thank you. Btw it looks beautiful. It’s only been about 5 months. It’s holding up beautifully! I’m using a wool rug in there (it’s become a toy/play room). It doesn’t have rubber backing but I guess I never really considered that would be an issue. I LOVE it! I think you’re going to love it too! 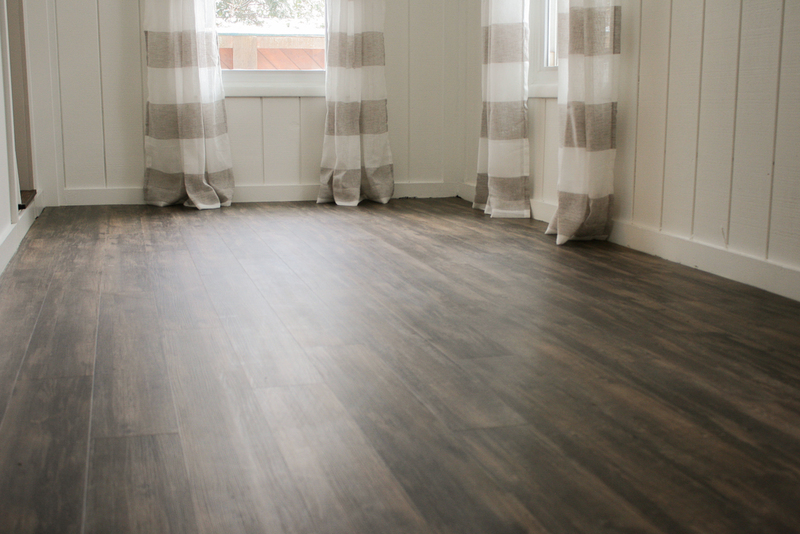 What is the color of this flooring? Antico? I chose the design “Antico” from the Classico collection. It’s a beautiful distressed-inspired look with gray/brown wood tones. I think it resembles weathered wood. I stumbled upon this post because my husband and I are seriously considering the Antico for our combined entry/dining/living/study area. I love it on the sample, but I’m so nervous it’ll be too dark or too busy. 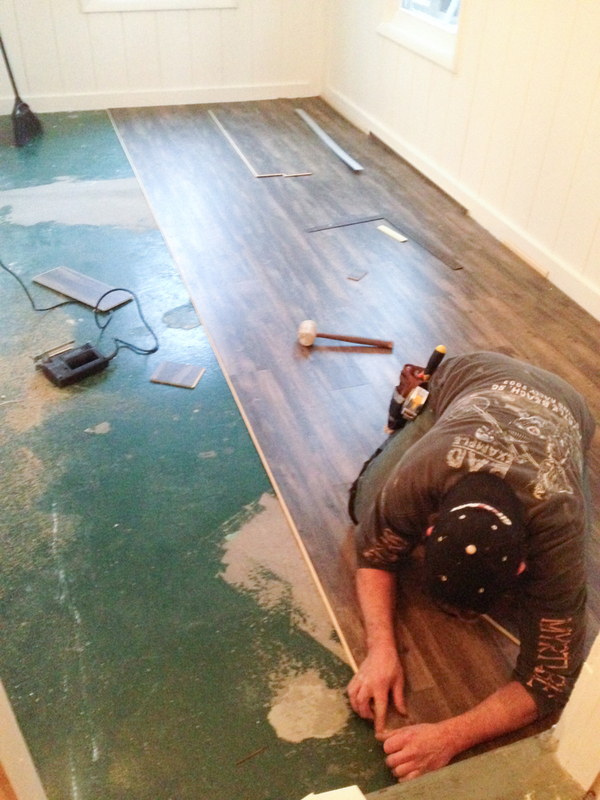 Our flooring guys say we have good natural lighting and we’re updating the lighting in the rooms as well. Our style is rustic modern and we will have all kinds of wood colors in the room black/gray/brown, so I’m nervous about that too. Thoughts or guidance? Thank you! Hi Sheridan! I don’t think you’ll find it too dark or busy at all once it’s installed. It’s a beautiful rustic look in light to medium gray/brown color tones and I think it sounds like a great fit to compliment your style! Good luck! I’d love to see it!